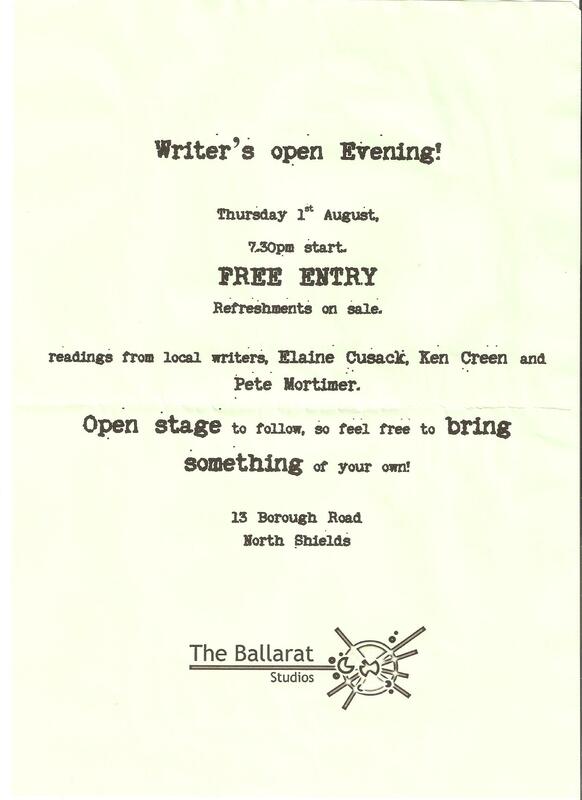 The Ballarat Studios in North Shields is hosting an open evening for local writers on Thursday August 1st. The event is FREE and aimed at writers of all persuasions who live in and around Tynemouth, Cullercoats, Whitley Bay and North Shields. The evening will offer attendees the chance to meet other writers and discover what the newly-opened Arts and Performance venue on Borough Road can offer them this autumn. Local writers including Peter Mortimer, Ken Creen & Elaine Cusack will perform their work. The event starts at 7.30pm and refreshments will be available. Where: The Ballarat Studios, 13 Borough Road, North Shields, Tyne and Wear, NE29 6LU. Where’s that?! Only a 3 minute walk from North Shields Metro station. Parking is available on the street (Borough Road) outside of the venue, and is free all down the bank towards the ferry terminal.